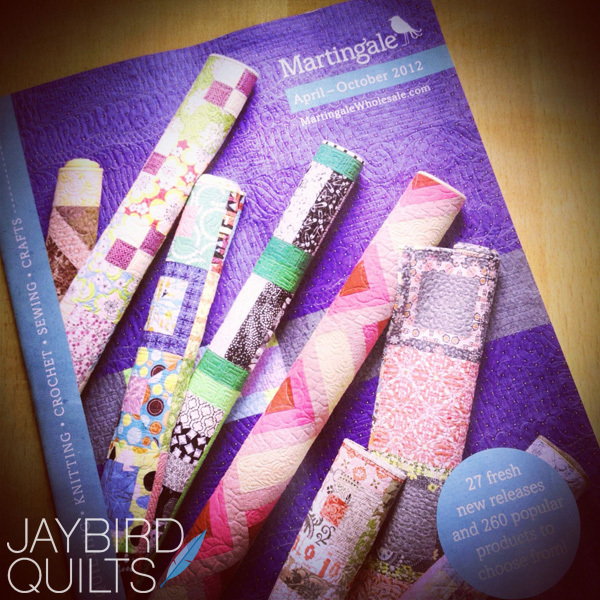 Martingale just sent out their new catalog... and they featured my quilts on the cover! I had no idea this was going to happen so I was SUPER excited when I saw it arrive in the mail. Recognize any of the quilts?? I'm still busy working away getting ready for Quilt Market. I fly to Kansas City two weeks from today... eek!! Yesterday I made a baby size version of Yummy using Marmalade by Bonnie & Camille. I love how it looks with the bright red sashing! Since I don't have anything else I can show yet... I have a few book reviews & more panned for you this week. Some will even have giveaways! Stay tuned! I thought it was Yummy in the yellow and gray, but this one is even Yummier! The cover is beautiful as is the quilt. I had to yell at my local quilt shop for not having your quilt patterns in. They did say they could order them, though. After my hissy-fit, I'm hoping they will just be sitting in the shop waiting for me the next time. Excellent, that means mine will be in the mail soon! Did you frame it yet? Congratulations!!!! The cover is totally exciting! What a wonderful surprise! I recently started to follow your blog and LOVE it and your quilts/patterns/info is great too. I have a question for you, maybe your readers too. :) I sew clothing and cute little toys for kiddos, but have never attempted a quilt and would really love to. What suggestions do you have for a "starting point", or what pattern(s) do you have that would be a good idea to give a "whirl"? Thanks! Keep up the awesome work! This really helps me see the pattern and it doesn't look hard at all. I sure appreciate the quilt in these colors easy to see that I now want the pattern. Thank You. Very exciting famous girl, you have arrived. Very few can say they are one the cover! I am honored to follow you in blogland! Yipee zipee! Congrats on being a cover girl! 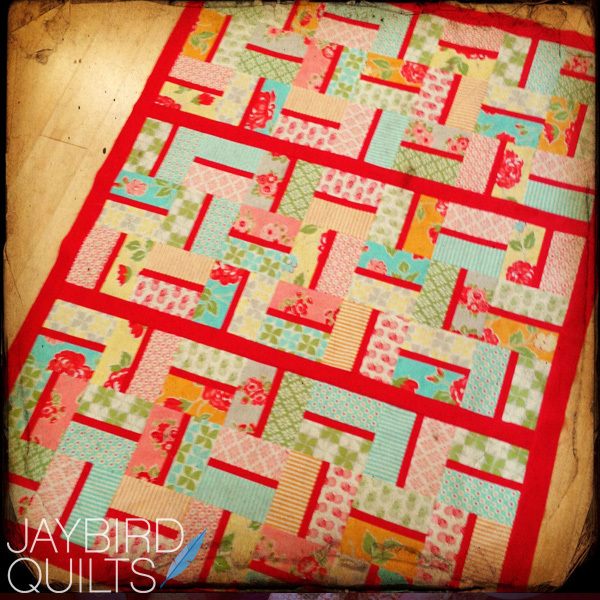 Love the marmalade quilt. I can't wait for October (I think that's when it's available). I love the red as sashing! That red version of Yummy is adorable! I am working on my first quilt (Yee!!!) and I don't have any idea how it's possible to topstitch something this big on a domestic sewing machine. Don't you end up with giant wads of fabric being shoved awkwardly through a tiny space? You can see the quilt I'm working on if you go to my blog... it's going to be full size when I'm done. Tips from you, or any of your readers, are welcome! I'm a newbie.